1. Hair Conditioner - Moisturizes for softness & manageability For dry or damaged hair Promotes strength. 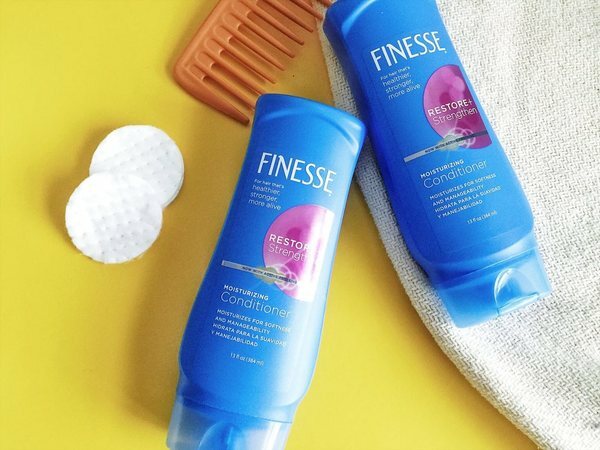 Get hair that’s healthier, stronger, and more alive with Finesse. Infused with active proteins that penetrate deep into the hair shaft, Finesse Restore + Strengthen Moisturizing Conditioner leaves hair more moisturized and manageable. It helps restore and strengthen hair that is dry, damaged, frizzy, coarse, or just stubborn. Hair is left feeling silky soft while being easier to detangle and easier to style. 2. Hair Shampoo - Moisturizes for softness & manageability For dry or damaged hair Promotes no build-up. Get hair that’s healthier, stronger, and more alive with Finesse. Infused with active proteins that penetrate deep into the hair shaft, Finesse Restore + Strengthen Moisturizing Shampoo leaves hair more moisturized and manageable. It helps restore and strengthen hair that is dry, damaged, frizzy, coarse, or simply stubborn. Hair is left feeling clean and silky soft while being easier to style.